This specially designed resource aims to teach basic skills in a fun and engaging way through music. 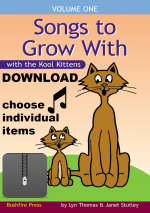 It includes 10 action-based songs, covering counting, colours, left & right, days of week, big & little, body awareness, self esteem & more. Songlist: Cool Kittens Rap, Moving Colours, Left and Right, Fingers and Toes, My House, Seven Days, In The Mirror, Big and Little, Legs and Lullaby.